According to a study published in Nature, 15.3 billion trees are chopped down every year, and roughly 46% of the world’s trees have been cleared over the past 12,000 years. For most manufacturing, wood is not even necessary anymore, but unfortunately, humans have been slow to develop alternatives. A Dutch start-up called CocoPallet is one of the companies that are working to change this. CocoPallet makes transportation pallets from coconut husks, which means that the material is 100% organic and it also being recycled from a waste product. The process used by CocoPallet is actually cheaper than using wood, and the design is more practical and durable as well. It is estimated that the company saves roughly 200 million trees from being cut down every year since shipping pallets are used everywhere. The technology was initially developed by researchers at Wageningen University but was later commercialized by Michiel Vos, founder of CocoPallet. Crafting objects out of coconuts never occurred to Jan Van Dam, a plant scientist at Wageningen University, but over 20 years ago, an Indonesian man entered his office at the college to show him something. At the time, Van Dam specialized in developing materials out of plant fiber, but this was something he had never seen before. “It looked like a normal piece of hardboard. But according to this man, it was not made out of logged trees, but completely made out of coconut bark, the outer shell of the fruit. Rock hard, wood-like board material from coconut husk? That was new to me,” Van Dam told Dutch news source ‘de Volkskrant’. Van Dam also explained that a recyclable product like this is needed, especially in places like Asia where coconut waste is abundant. “I saw a huge potential here. 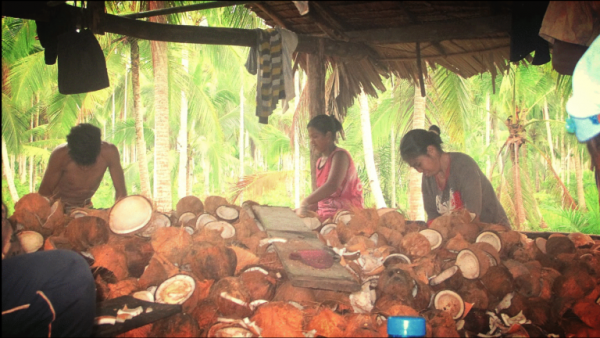 Mainly in Asia, enormous amounts of coconuts are produced, which leads to a huge pile of wasted coconut husk. In many tropical countries, the coconut waste is rotting away by the side of the road or is set on fire. If you make raw materials out of the husk, you will hit several birds with one stone: you prevent deforestation, because less wood will be produced, you give the farmers an extra income, because their waste is worth money, and you prevent the material from slowly rotting away, reducing pollution and climate change.” Van Dam says. 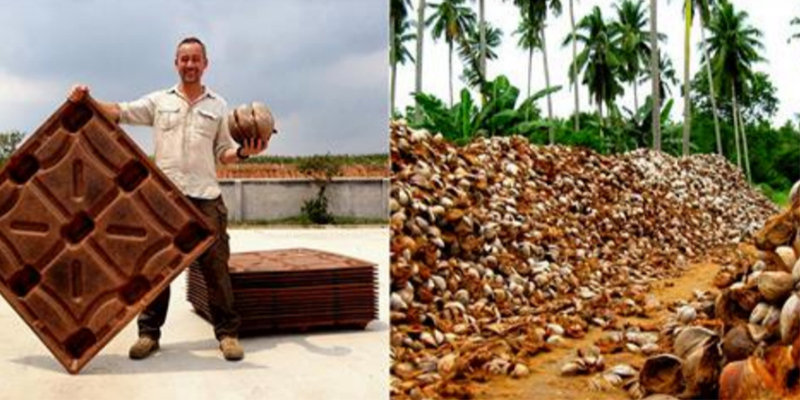 After learning of the incredible technique, Van Dam attempted to launch an effort to make pallets out of coconut shells in the Philippines, but that program was short-lived. “Due to local circumstances, it failed. For example, there was no sufficient power supply,” Van Dam explains. Luckily, years later the idea was picked up again by Michiel Vos, who asked Van Dam for advice about alternatives to wood. “I ended at Van Dam. 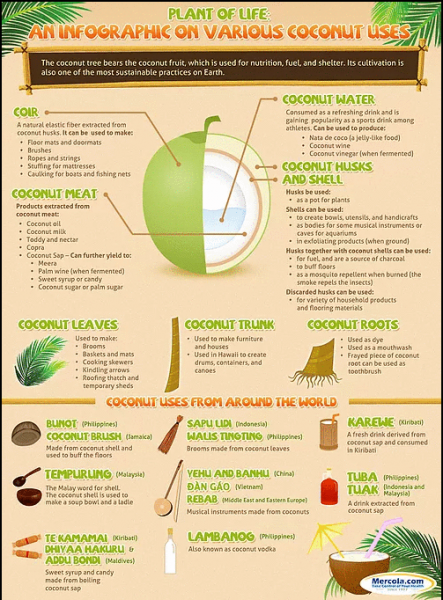 Why don’t you use coconut husk, he asked? It contains the glue as well as the materials to glue together. And anywhere in Asia it is found almost for free on the side of the road. Stunned, I left his office with his final report under my arm,” Vos said. Vos said that pallets were the perfect use case for this technology. “Asia produces more than a billion pallets every year. They require softwood, which does not grow in the tropics, thus is imported from Canada, New Zealand or Eastern Europe on a large scale. Complete forests are being shipped to Asia to make pallets, that are mainly used to ship products back to America or Europe. It is clearly a lot more efficient to make them in Asia with local materials,” Vos said. “CocoPallets have important advantages: they are stronger and lighter than the old-fashioned pallets, they are fire retardant, and thanks to an adjusted design, also easier to stack, so they take up less space. Above all, they are cheaper, and a lower price is always the best sales argument for a sustainable product,” he added. 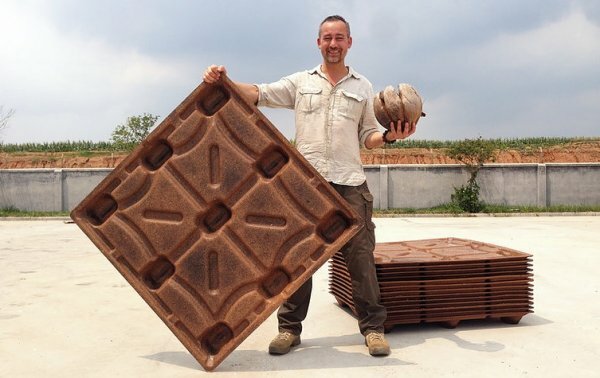 CocoPallets are a solution that saves millions of trees, while also recycling a waste product.
? 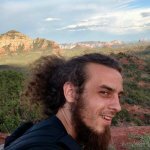 19-Year-Old Arrested After Putting LSD Into Co-Workers’ Drinks To Get Rid of Their ‘Negative Energy’ Flat Earthers Are Planning A Cruise In 2020 To Get To ‘The Edge Of The World’ ?